Make the most of one of spring's most exciting foodie bounties with this simple and delicious wild garlic pasta dough recipe. The pungent leaves provide plenty of colour and flavour to the dough, which can be rolled and cut into any shape you desire. This fresh pasta dough is a lovely way to make the most of the fleeting wild garlic season. Not only do the leaves give you a vibrant green dough, but fragrant notes of garlic come through too, giving you an extra flavourful pasta. The dough contains no salt, so be sure to heavily salt your cooking water for nicely seasoned pasta. 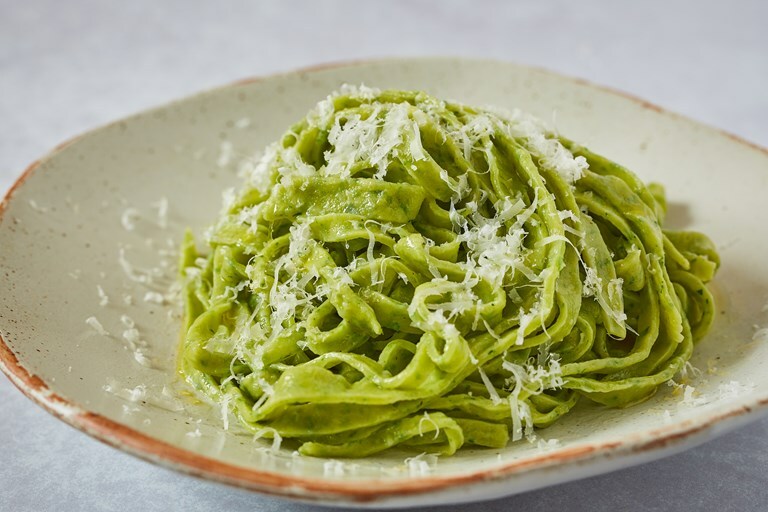 Because you have that extra garlicky flavour coming from the pasta itself, you can keep the sauces pretty basic to allow the wild garlic to shine – pasta with a simple cream sauce, or tossed in olive oil with plenty of grated Parmesan, is a glorious thing! Another simple but rather more luxurious dressing idea is Helen Graves’s brown shrimp sauce, which combines salty, umami and rich brown shrimp with a kick of chilli and a zing of lemon – all wonderful pairings for wild garlic. If you want a double whack of garlic, trying tossing it in wild garlic pesto, and if it’s later in the season, be sure to garnish with the pretty white wild garlic flowers – these also have a wonderful hit of floral garlic to them. Once you’ve mastered the pasta, you could try experimenting with other doughs – Francesco Bracali makes a vibrant nettle gnocchi recipe which could be easily converted into a wild garlic gnocchi by switching the greens.